The River Hawks earned a hard fought 3-1 win over third-ranked Providence Saturday night at the Tsongas Center. 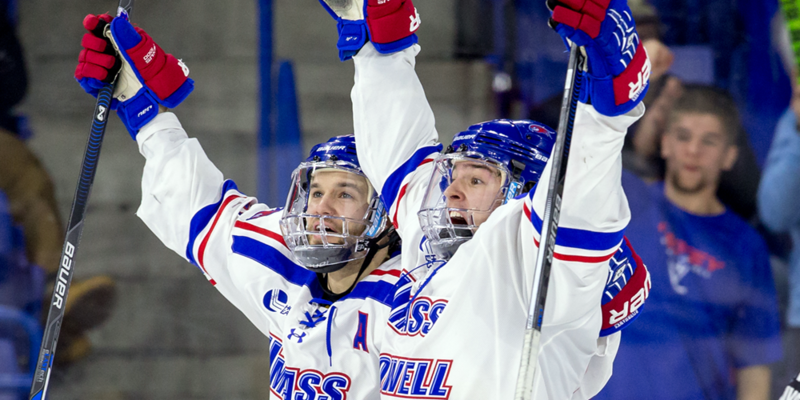 UMass Lowell (15-5-4) and Providence (16-4-4) split their weekend series. Michael Kapla scored what would be the game-winning goal midway through the third win he slid the puck through the legs of Providence goalie Nick Ellis. Four minutes later, Rtan Dmowski put away his third goal of the season on a power play to give the River Hawks a little cushion down the stretch. Kevin Boyle stopped 20 shots in what was another strong performance. Boyle only saw five pucks come his way the entirety of the third period. The River Hawks played probably their best hockey of the weekend in the final twenty minutes of Saturday’s contest. They got 14 shots on goal, two of which resulted in goals, and kept to their assignments defensively to severely limit the action in front of Boyle. The fatigued showed from Friday’s game as the puck dropped to start the contest. Each team killed off a penalty and fired nine shots on goal in the first period, but heading into intermission the scoreboard had not budged. The Friars struck first midway through the second when Brandon Tanev netted his tenth goal of the season on a powerplay. The lead would not last the period, however, as Jake Kamrass tied the score with just a minute left. Kamrass gathered a floating puck at his offensive blue line, and was able to steady it before firing a devastating wrister that beat Ellis top-shelf. Friday’s game was a 4-2 win by the Friars that was in large part due to a three goal outburst by Providence in the first period. The River Hawks outscored them 2-1 in the next two periods. With how Saturday nights game unfolded, one can argue that UMass Lowell won five out of the six periods of hockey played this weekend. The River Hawks have a non-conference matchup at home next weekend against Arizona State.